Miles of trails, wildlife, and a beautiful lake await you! Despite the vicinity to the bustling metro area, there are relatively large "islands" of wilderness nestled into the urban and suburban surroundings. Lake Frank, located in Rockville, MD is one of these islands. 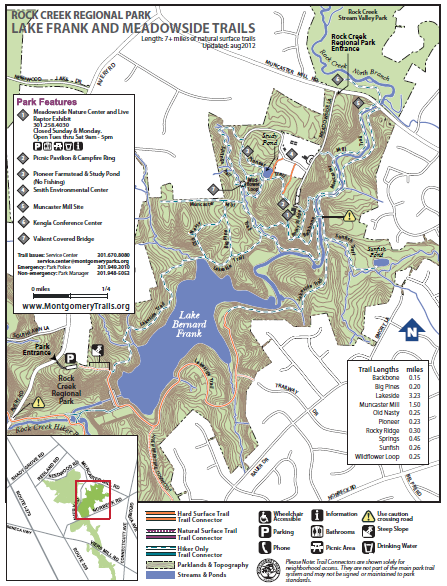 Access to the park is off of Avery Road or from the Meadowside Nature Center off of Muncaster Mill Road. The address for the nature center is 5100 Meadowside Lane Rockville, MD 20855. The nature center boasts a variety of educational activities (many geared towards younger visitors). The flagship trail at Lake Frank is the "Lakeside Trail," which runs along the shoreline of the lake and a connected creek. About a third of the trail is paved, while the other two-thirds weave through the woods with occasionally steep terrain. For those wanting a bit of a more challenging trail, the "Old Nasty" trail connects with the Lakeside trail along the northern shore. Old Nasty is short but quite steep. There are various other trails that vary in difficulty within the park. 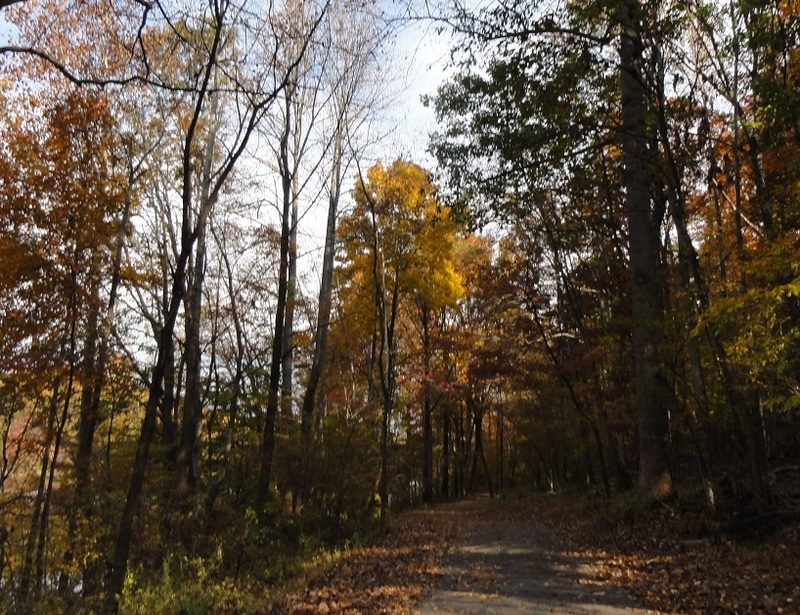 Visitors who park at the trailhead off of Avery Road are greeted by a steep incline that descends towards the dam. 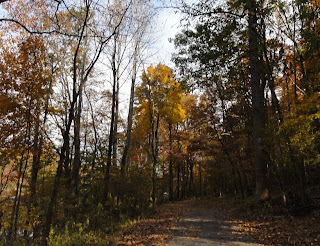 You will have a choice whether to start with the wilderness portion of the trail or the paved portion of the trail. Cross the dam first for the paved section, or take a left at a wooden post for the wilderness portion. If you complete the entire 3.23 mile circuit, you will have to cross a stream in the northern part of the park. This crossing may be difficult or impossible during times of high water. Overall, this walk is a bit challenging for people not accustomed to hiking, but an easy 3+ mile trail for seasoned hikers. The road noise from nearby Norbeck Road is almost undetectable from within the park, and visitors are treated to a true wilderness setting while at Lake Frank. Weekdays provide the quietest park experience while weekends tend to show a spike in hikers and dog walkers. Just remember your trail manners! Lake Frank pops out into brilliant color in the fall when the leaves begin to change. The water creates a wonderful foreground for photographers and casual observers alike. Once the leaves have fallen in winter, the lake itself is easily visible from almost all points on the trail (except where the trail follows the creek instead). Spring will feature flowers and trees blooming with an abundance of animals to observe as well. It is strongly recommended that disabled and handicapped visitors access the park via Meadowside Nature Center due to the prohibiting terrain on the Avery Road side of the park. 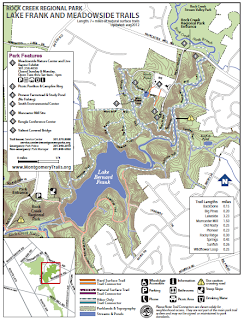 Bikers can also access the trails at Lake Frank via the Rock Creek Hiker/Biker trail connector in the southern portion of the park. Using this connection, visitors can also access the Rock Creek trail system. All in all, Lake Frank provides an incredible oasis away from the urban setting of the Washington area. It is a quiet place where everyone can enjoy the sound of running water, and the wind rustling through the trees. Make sure to pack water as there is only water available at Meadowside Nature Center. Pack light, though so you can fully enjoy the park and all it has to offer. Although locations like Sugarloaf Mountain in Comus, MD and the mountainous terrain of western Maryland are fairly close, Lake Frank provides a more easily accessible wilderness experience. The park is a good fit for people of all ages and lifestyles. The official reporting station for Washington (DCA) has not recorded a 2-inch or larger snowfall in several years now. Will the streak be broken this winter, or will DC snow lovers have to wait until next winter for another shot? The last substantial winter storm to impact the Washington Metro area occurred on January 26, 2011. This was the infamous Commutageddon storm that stranded motorists during the evening rush hour that day. Approximately 5 inches of snow fell on the city during that storm, with significantly higher amounts in the suburbs in some cases. Heavy snow accumulation during the January 26, 2011 storm. With March fast approaching, many snow lovers in the area have been left to wonder if we will see another winter season end without a 2-inch or larger snowstorm. As it stands right now, various computer models are suggesting that a better pattern for snowfall may evolve as we head into the late February and early March period. However, given that every storm this winter so far has found a way to not come through for DC, the odds are likely against a big snowfall at this time. It seems that the pattern of having systems that are either too warm, or contain too little precipitation will continue for now. There are several weather systems being depicted on the weather models at this time. That being said, the systems that are projected to impact the metro area are shown to not be favorable for a substantial snowfall (or any snowfall at all for that matter. Even so, weather is a constantly changing/shifting thing and the models might shift accordingly as we head into March. Still, March is a transition month where snow becomes less likely quite fast. If one were basing a prediction off of the historical records, DC has about until the middle of March to cash in. 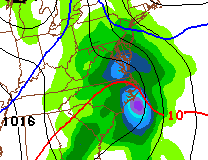 The blue line indicates the 850mb freezing line. Note that it is well north of the area. At this point in time, all that can be said is that the pattern may improve for a CHANCE of breaking the 2 inch snowfall streak. However, we are at a period when we are battling rising sun angles and warming average temperatures. The average low is above freezing at DCA now! Spring is heading into the area...we'll see if old man winter can get in one last blow. This is the first part in a multi-part series about the positives of the WMATA rail system in the Washington area. The author is not an employee of WMATA and the opinions represented in this series are his own. Thank goodness all of the cars we rode in had cool A/C! On a seasonably hot day late last July, a relatively new friend and I set out on a journey to traverse the entire Metro system in Washington. There was no particular reason to take on such a task, but others had done it in the past and we happened to have an open day. So a few days prior, the plan had been finalized to meet at the Rosslyn station. I parked my car at Glenmont and shuffled down the escalator with the typical mix of DC office workers and students. The night before, I had loaded an unlimited day pass onto my Smartrip card in preparation for this adventure. The turnstile registered the pass and I settled into a window seat on the train. Before long, the train lurched to life and began its journey towards Shady Grove (the western terminus of the Red Line). After a transfer at Metro Center, I arrived to a hazy or smokey platform at Rosslyn. It also appeared that the power was out to about half the station. It was stuffy and rather uncomfortable in the station but the crowd exiting and entering trains seemed content. After exchanging a few text messages with Megan, (my adventure partner) we determined that the new meeting place would be Vienna. From Vienna we traveled the entire length of the Orange Line until the train terminated in New Carrollton. Megan had been asleep for a portion of this leg of the trip. The train gathered a larger crowd as it approached the downtown area, and predictably the crowd tampered off significantly as we exited the city on the other side. One thing I noticed was how cheerful and enthusiastic the train operator sounded on this line. He seemed genuinely happy to be a WMATA employee on this summer morning. Amtrak was rolling through New Carrollton as we waited for our train to depart. From New Carrollton we returned to the Stadium-Armory station to head out to Largo Town Center on the Blue Line. Methodically, we checked stations off our lists and progressed through the system in an efficient manner. We got some strange looks from station employees at times (especially when our farecards refused to allow us to exit a station at one point). Nobody seemed to understand why anybody would want to devote 8 hours to riding on public transportation. Throughout the adventure, one thing I noticed was that despite there being many types of people entering and exiting the trains we were on...the common trait was that we were all Metro riders. There was no point where I felt unsafe (even in some of the more sketchy areas). Surprisingly, we encountered no delays (save for a 1 or 2 minute stop on a part of the Red Line). Perhaps we got lucky? With that said, I seem to always get lucky when riding on this rail system. Perhaps it's the fact that I'm never a quick person to get impatient. I realize that I may be skewed from not having to ride Metro in an effort to get to a job or commitment. However, I think it's important that Metro riders take a moment to appreciate how much this system has expanded to cover more and more people since the opening in March of 1976. My adventure partner Megan has put together a nice video of our trip last July. Metro Challenge: July 30th, 2012 from Megan Buche on Vimeo. We'll take a further look at some of the things that WMATA does right on their rail system in the next installment of this series.